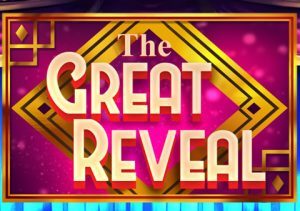 Try and pull a rabbit out of the hat and conjure up a jackpot in The Great Reveal. This 5 reel, 40 payline, magic-themed video slot is from Playtech and comes with classy sound and visuals and some potentially exciting extras. Collect keys to reveal stacked wilds that lock in place for 2 spins. There’s also a free spins round with 2 or 3 stacked wilds landing 3 throughout. Stakes range from between 10p and £500 per spin. Playtech has created a lovely looking game here. Flanked by the curtain of a traditional theatre stage, the reels feature lower vale A to J royal symbols as well as magic-themed props. They include playing cards, red roses, top hats, rabbits and doves. The most lucrative symbol is the dandy magician, looking resplendent in his white tie and tails. Land 2, 3, 4 or 5 of the magician in the same payline and you’ll receive a payout equal to 0.1, 0.3, 1 or 5 times your total bet. Helping to create those winning combinations are the magician’s assistants who come into life during the game’s pair of features. Wild Reveal feature – above each reel are 2 padlocks. Whenever a key symbol lands, it unlocks 1 of the padlocks above that reel. Once both padlocks are open, a wild magician’s assistant fills the whole of that reel. The wild assistant will stay locked in position for the 2 spins that follow. The Great Reveal Free Games feature – this round is triggered when you land 3 of the logo scatter on the same spin. You’ll then have the pick of 3 free spin and stacked wilds combinations. The stacked wilds can hit on different reels with each free spin. Every time you land a scatter 1 extra free spin is added to your total. I would opt for the first option as 3 wild reels on each free spin can lead to big wins. We enjoyed The Great Reveal. The imagery is impressively done and the jazzy soundtrack gives the game a classy feel. The gameplay impresses too. We landed plenty of stacked wilds in the base game as well as during The Great Reveal Free Games feature. Saying that, you can only win 400 times your bet on every spin so it’s not very volatile at all. I would much rather try my luck with more volatile Playtech offerings like Legend of the Jaguar.